Pyongyang University of Science and Technology is North Korea's first privately funded university. It opened in 2010. But, the head of the school says the university is facing financial difficulties because of international sanctions against North Korea. Chan-Mo Park is the university's chancellor. He is a former computer science professor at the University of Maryland and a U.S. citizen who was born in South Korea. He told VOA on Wednesday, "We want to recruit South Korean professors, but the May 24 measure blocks it." He was referring to trade and exchange sanctions South Korea made against North Korea on May 24, 2010. The sanctions came after South Korea accused the North of sinking one of its naval boats and claiming the lives of 46 sailors. North Korea's nuclear and missile tests earlier this year have further isolated the country. In March, a United Nations Security Council resolution placed further restrictions on North Korea's financial activity. The school chancellor says that despite international tensions, the university is growing. It is largely supported by Western-based Evangelical Christians. It currently hosts about 500 enrolled students and 100 professors. Some are U.S. citizens. Park says the school offers North Korean students rare opportunities to engage with Western-trained scientists. "We were doing a virtual reality class and some students turned in materials about American hip hop music for their homework," said Park. He described students as eager to learn about the outside world. Critics argue the institution could help the North Korean government further develop nuclear technology. Park said this is not the case. He said the school's curriculum meets U.S. regulations. He asked me, cap in hand, if I could help him out of his financial difficulties. Writers often refer to a dictionary. Hamas has been crippled by international sanctions because of its refusal to renounce violence and recognize Israel. They may even accuse the child of disloyalty. 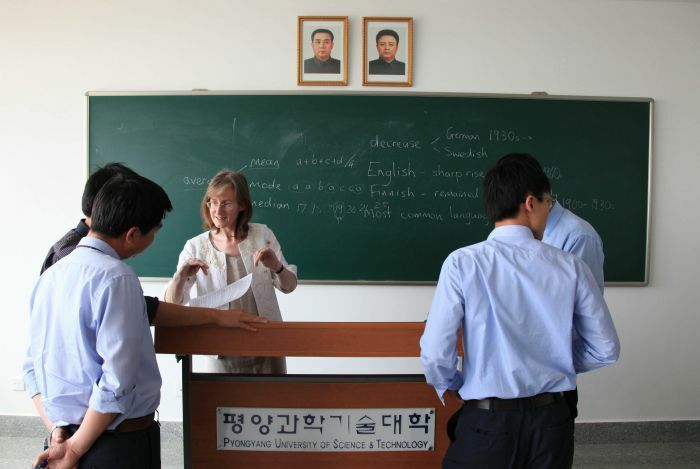 1.Park says the school offers North Korean students rare opportunities to engage with Western-trained scientists. Better master one than engage with ten. If the big gear did not engage with the small one, the machine would refuse to work. 2. "We were doing a virtual reality class and some students turned in materials about American hip hop music for their homework," said Park. It is customary to turn in one's resignation two weeks before one's last day. Please turn in your assignment before you leave the classroom.